Vivahouse, a prefabricated modular housing system designed by Design Haus Liberty to turn vacant commercial properties into co-living environments, has been unveiled at a disused shopping centre in London. 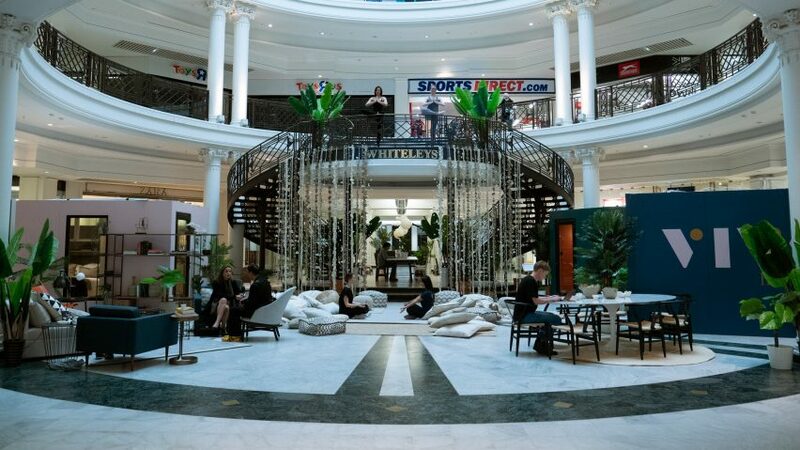 Branded as the "urban house of the future", Vivahouse has been installed as a short-term pop-up in London's empty Whiteleys Shopping Centre in Bayswater. The brand aims to install the units across London, taking advantage of the UK's struggling high street where in 2018, almost 1,000 retailers went into administration. It said it plans to repurpose unused commercial units, including vacant hospitality and office spaces to create much-needed homes. The concept is the brainchild of Rajdeep Gahir, who was an early employee of WeWork, and Dara Huang, who is the founder of Design Haus Liberty and a Dezeen Awards judge. The system of small, identical units can be built on site in under 24 hours inside existing buildings to create private rooms with shared facilities. The company said that the prefabricated system takes 70 per cent less time and costs 70 per cent less than traditional construction. Designed with young freelancers and the self-employed in mind, each Vivahouse location will have a different minimum duration of stay, which could be anything from one week up to one year. The company said rent will be location dependent but starts from £600 per month in city locations for a longer term stay and from £50 per night for a short stay. The company said that this is 50 per cent less expensive than the next best alternative for short or medium term stays in urban cities. The price of the units is inclusive of all bills, taxes and daily cleaning of communal areas. Bathrooms within the high specification units come equipped with toiletries and electronics while pantries are stocked with daily essentials, from toothpaste to tea and coffee. "Vivahouse is a product and operational business that is positioned to enable true housing as a service in major urban cities," co-founder Gahir told Dezeen. "We've created a solution to the UK's low availability of land and shortfall of housing, at a quick turnaround build time with a rapidly scalable model." The units can be set up to form communities designed to combat loneliness among "the nomad nation of freelancers" who now make up over 42 per cent of the UK's population. "Our Vivahouses are for millennials who currently spend two thirds of their income on rent, to give them a space they'll be proud to call home, where they can meet new people and stay on a flexible term. We are changing the entire renting game with this launch," Gahir continued. Prefabricated in the UK, the units fully comply with residential building regulations and include a double bed, storage, desk and bespoke lighting. "These spaces will not only accommodate short term renters but will encourage socialising amongst them, too," commented Huang, co-founder and creative lead at Vivahouse. "As an operator, Vivahouse will hold yoga and mindfulness sessions in dedicated and specially designed meditation spaces. We're also creating shared breakout and games areas outside of the rooms including living, dining and work spaces," said Huang. "This launch is about encouraging 'Generation Move' to not live in isolation as well as offering them the homes that they deserve in big cities," she continued. "We wanted to design Vivahouse to promote a comfortable and mature lifestyle to take away the stigma that micro living is focused on just students", continued Dara. "This is really a platform to showcase how design can alter perception and create comfort in even the smallest spaces." The Vivahouse units are installed within the central atrium of Whiteleys Shopping complex in Bayswater for a month up until 14 December 2018, in partnership with Warrior Capital and Meyer Bergman. Also hoping to "disrupt" the existing housing market and help resolve the housing crisis, earlier this year London developer Cube Haus commissioned a host of award-winning architects to design affordable modular houses for awkward urban sites.